Last night, we had a ‘Brave On Demand’ viewing party with some friends to celebrate the fact that Disney Pixar’s Brave is now available on both cable and satellite. I watched this movie for the first time this week and it was GREAT. I mean …. as a mom… it was hysterical crying. The “love relationship” that you follow during this princess movie is not between a princess and a prince. It’s between a mother and daughter. I really related to the story. 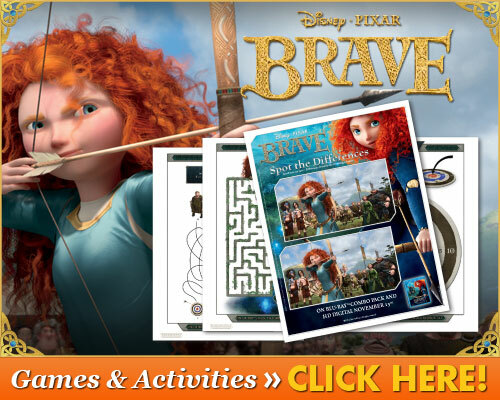 Did you miss watching Brave in the theatres? NO PROBLEM! Your cable or satellite provider has it on DEMAND right now. Your entire family will thank you because it’s not a TRUE princess movie – there is a LOT of action!!!! Set in the rugged and mysterious Highlands of Scotland, Disney Pixar’s “Brave” follows the heroic journey of Merida (voice of Kelly Macdonald), a skilled archer and headstrong daughter of King Fergus (voice of Billy Connolly) and Queen Elinor (voice of Emma Thompson). Determined to change her fate, Merida defies an age-old custom sacred to the unruly and uproarious lords of the land: massive Lord MacGuffin (voice of Kevin McKidd), surly Lord Macintosh (voice of Craig Ferguson) and cantankerous Lord Dingwall (voice of Robbie Coltrane), unleashing chaos in the kingdom. When she turns to an eccentric Witch (voice of Julie Walters), she is granted an ill-fated wish and the ensuing peril forces Merida to harness all of her resources—including her mischievous triplet brothers—to undo a beastly curse and discover the meaning of true bravery.